Though Vancouver has fallen to third on The Economist’s recently published list of most liveable cities in the world, our beautiful Canadian nook still holds the blue ribbon in the eyes of at least one international heavy-hitter.“Vancouver was one of my goals,” chef Massimo Bottura revealed as we sat chatting at UVA wine bar. Bottura — named ‘best chef in the world’ by the International Academy of Gastronomy — is the owner and patron chef of Modena’s world renowned Osteria Francescana. He was invited to Cibo by the downtown restaurant’s general manager David Fert. Indeed, the courses were intellectually stimulating. The Globe and Mail’s Alexandra Gill described it best when she compared the meal to haute couture. As many of us are wowed by the wild styles showcased on fashion runways, we don’t wear them regularly. The Bottura experience was like nothing I’ve had before and I doubt I’ll ever again have anything quite like it. 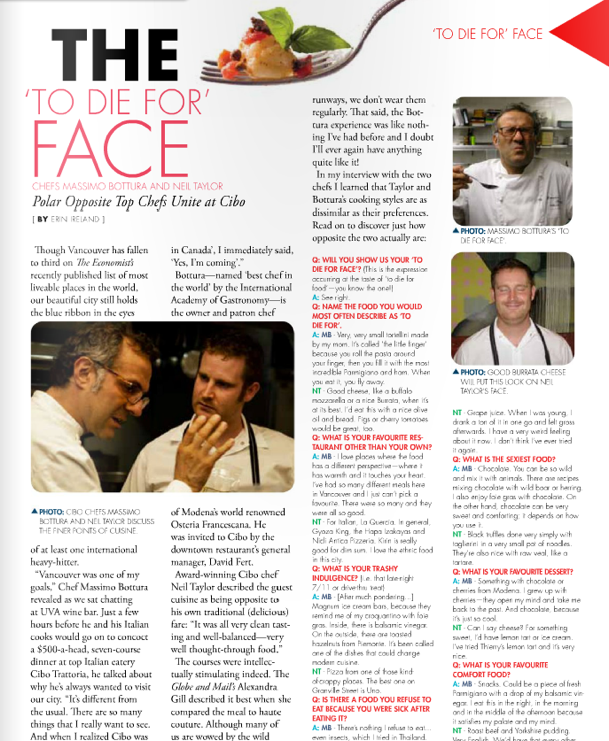 In my interview with each, I learned that Taylor and Bottura’s cooking styles are as dissimilar as their preferences. Read on to discover just how opposite the two are. A: MB — Very, very small tortellini made by my mom. It’s called ‘The Little Finger’ because you roll the pasta around your this finger, then you fill it with the most incredible Parmigiano and ham. When you eat it, you fly away. NT – Good cheese, like a buffalo mozzarella or a nice Burrata, when it’s at its best. I’d eat this with a nice olive oil and bread. Figs or cherry tomatoes would be great, too. Q: What is your favorite restaurant other than your own? A: MB — I love places where the food has a different perspective — it has warmth and it touches your heart. I’ve had so many different meals here in Vancouver and I just can’t pick a favorite. There were so many and they were all so good. NT — For Italian, La Quercia. In general, Gyoza King, the Hapa Izakayas, and Nicli Antica Pizzeria. Kirin is really good for dim sum. I love the ethnic food in this city. A: MB — [After much pondering…] Magnum Ice Cream Bars because they remind me of my croquantino with foie gras. Inside, there is balsamic vinegar. On the outside, there are toasted hazelnuts from Piemonte. It’s been called one of the dishes that could change modern cuisine. NT — Pizza from one of those kind of crappy places. The best one on Granville Street is Uno. A: MB – There’s nothing I refuse to eat…even insects, which I tried in Thailand. I’ve eaten lots of extreme food. NT — Grape juice. When I was young, I drank a ton of it in one go and felt gross afterwards. I have a very weird feeling about it now. I don’t think I’ve ever tried it again. A: MB – Chocolate. You can be so wild and mix it with animals. There are these medieval recipes mixing chocolate with wild boar or herring. I also enjoy foie gras with chocolate. On the other hand, chocolate can be very sweet and comforting; depends on how you use it. NT — Black truffles done very simply with taglierini in a very small pot of noodles. They’re also nice with raw veal, like a tartar. A: MB – Something with chocolate or cherries from Modena. I grew up with cherries — they open my mind and take me back to the past. And chocolate because it’s just so cool. NT — Can I say cheese? For something sweet, I’d have lemon tart or ice cream. I’ve tried Thierry’s lemon tart and it’s very nice. A: MB — Snacks. Could be a piece of fresh Parmigiano with a drop of my balsamic vinegar. I eat this in the night, in the morning, and in the middle of the afternoon because it satisfies my palate and my mind. NT — Roast beef and Yorkshire pudding. Very English. We’d have that every other Sunday when I was growing up. This article was written for Vancouver View Magazine. You can follow them on Twitter, too –> @VancouverView.